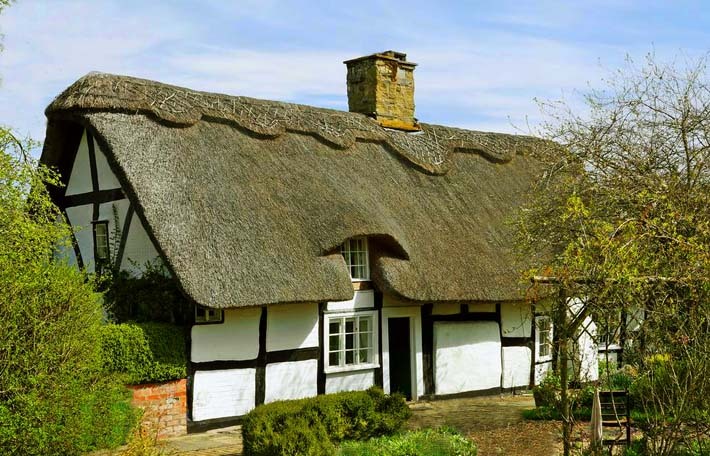 Thatch is now thinly and widely scattered throughout these two historic counties, which lie on the southern edge, of the Northern thatching tradition. 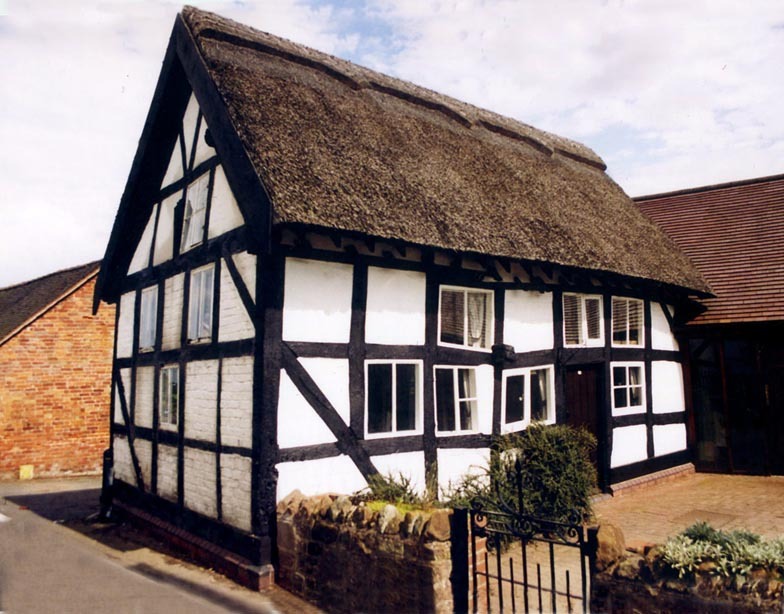 Watling Street, the main boundary between thatching styles, skims through southern Staffordshire and cuts right through Shropshire. But areas hereabouts, on either side of the old Roman road, are generally similar. 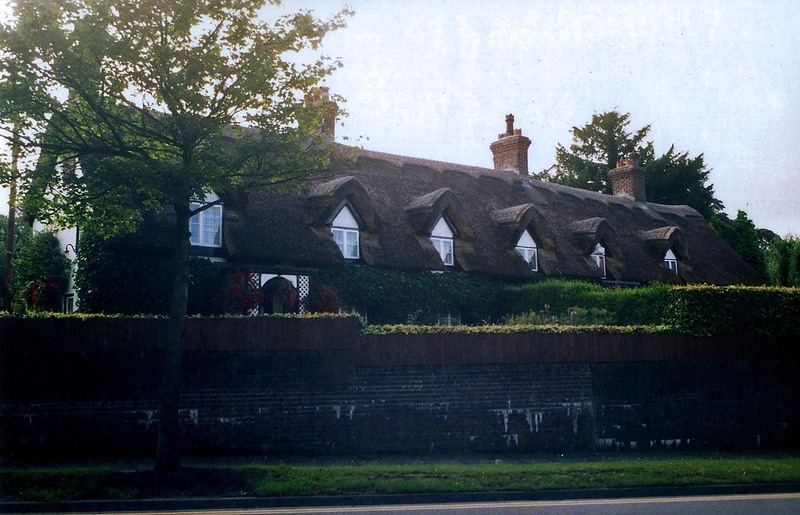 Something of a local speciality, are the very wide eaves; often seen on thatch, in the south of both counties. Hinting at some influence from the Southern tradition. 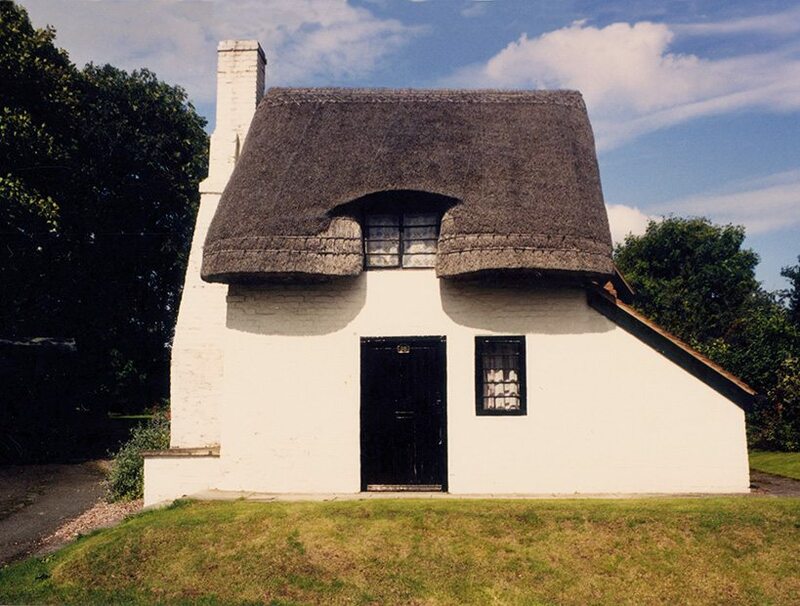 But rolled or boarded gables and a fairly angular roof shape, are found throughout. The use of long straw, once the main coating material, seems to have disappeared. However work in combed wheat reed, following an old style, is common; especially in Shropshire. 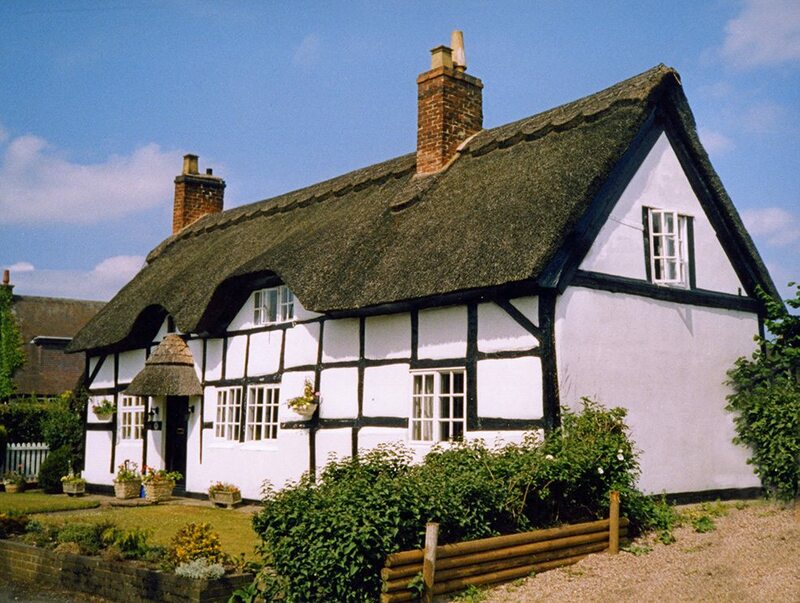 Shropshire has good groups of thatch, south east of Shrewsbury and around Ellesmere. 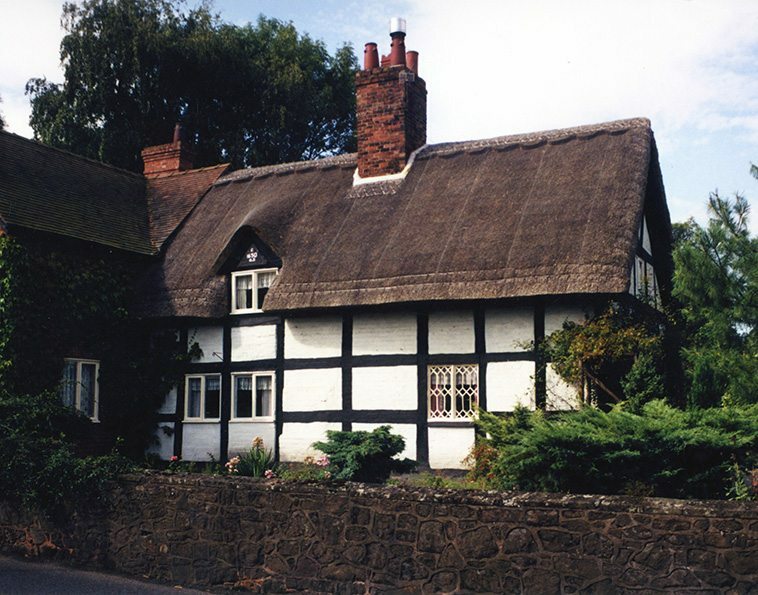 By far the most thatch in Staffordshire, lies in the large village of Alrewas, north of Lichfield. 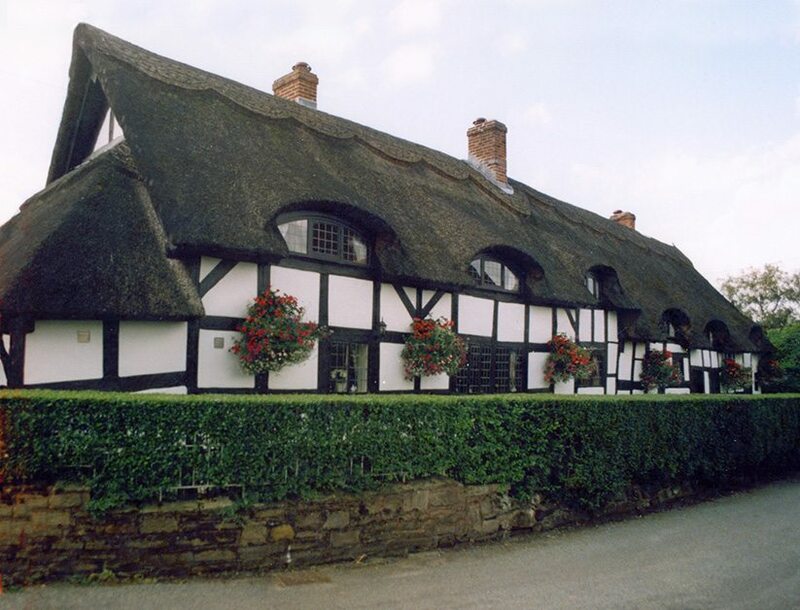 Perhaps the best known thatched building, in this county, lies north west of the county town. Once owned by one of it’s more famous sons…. 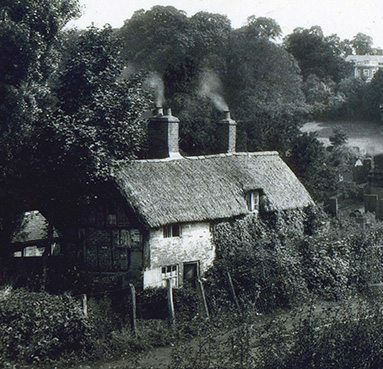 Izaak Walton’s Cottage at Shallowford, has had a chequered history, surviving near dereliction, two fires and five decades under tiles. 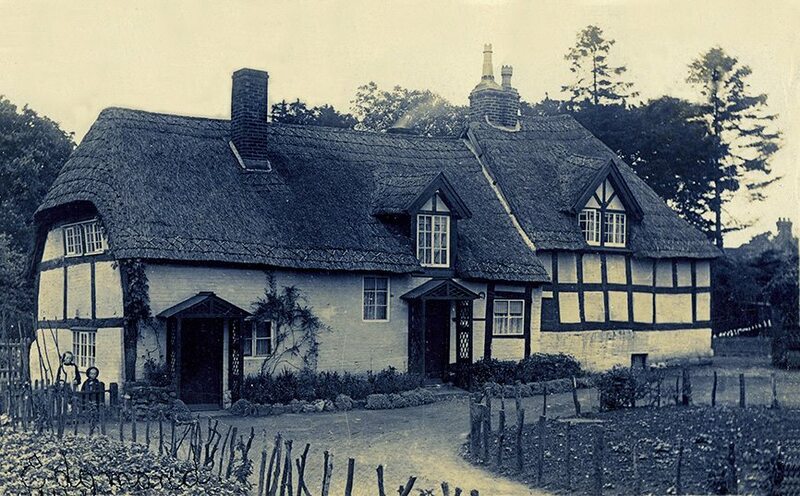 The father of angling, would now probably recognise his old property. Except that combed wheat reed, replaces the traditional long straw thatch. 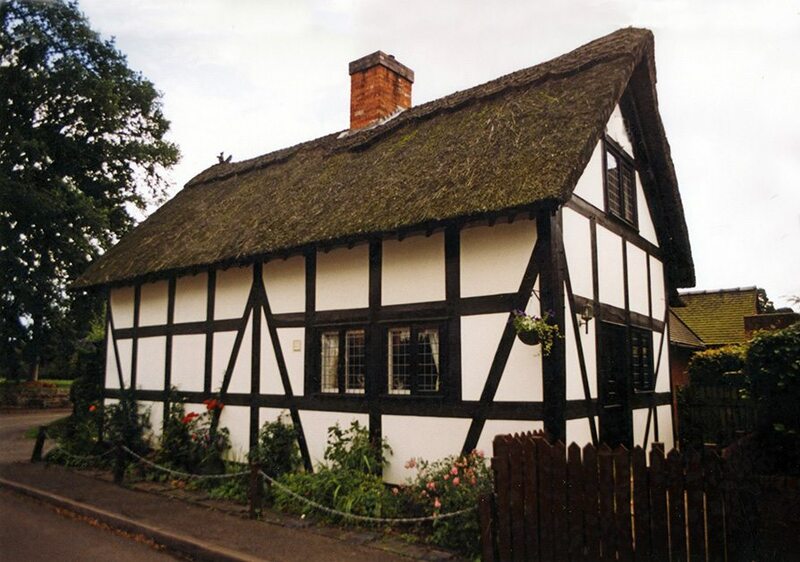 It is now a charming museum, clebrating the author of; The Compleat Angler or the Contemplative Man’s Recreation. Published in 1653, only the Bible and Shakespeare, have had more editions. 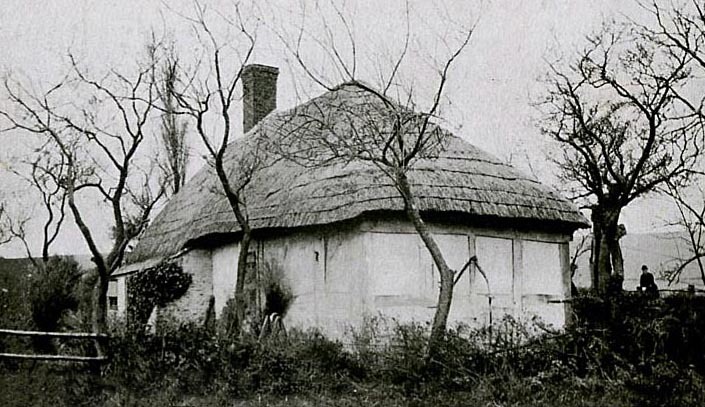 Izaak Walton’s Cottage… Part of a farm, Izaak bought as an investment. Leaving it to his home town. The rents, to provide for the poor. Later, sparking steam trains, passing close by, caused two major fires in the last century. But electric has replaced steam. 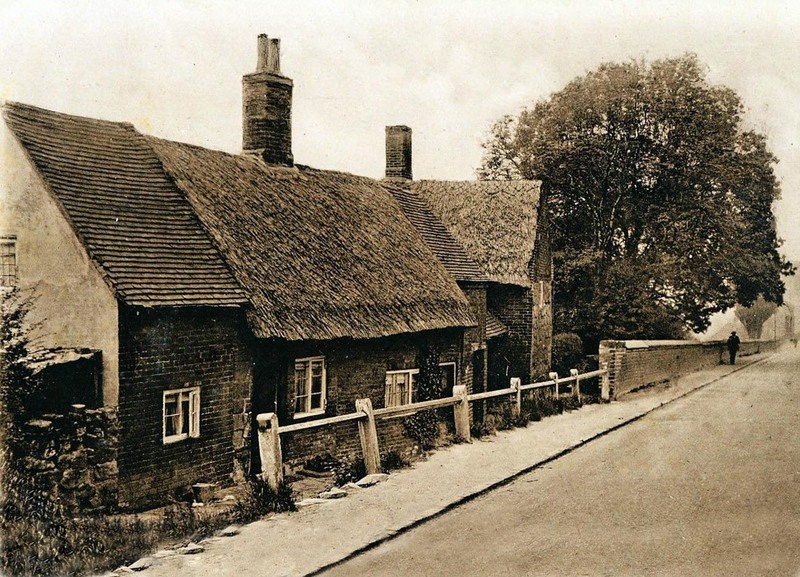 And thatch the tiled roof, this building had for half a century. Photo; kind permission, Izaak Walton Museum. 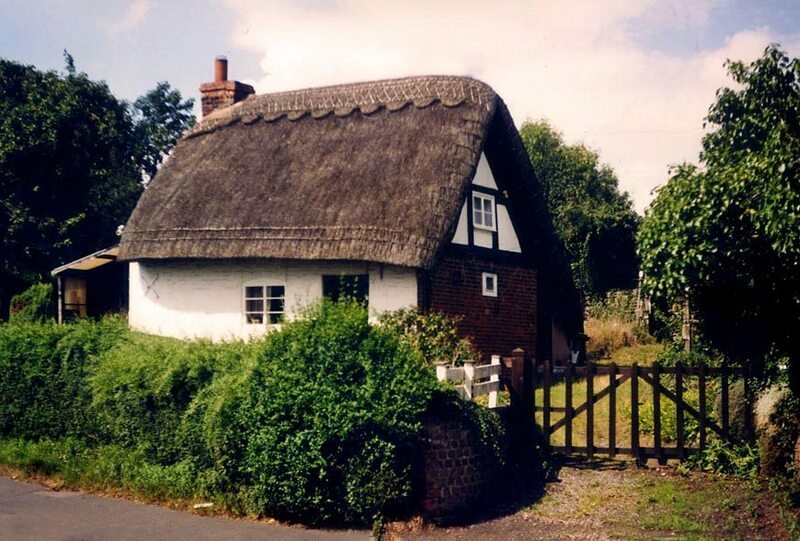 Hodnet… This Shropshire village, still has some thatch. But less, than when the above, Edwardian scene was captured. 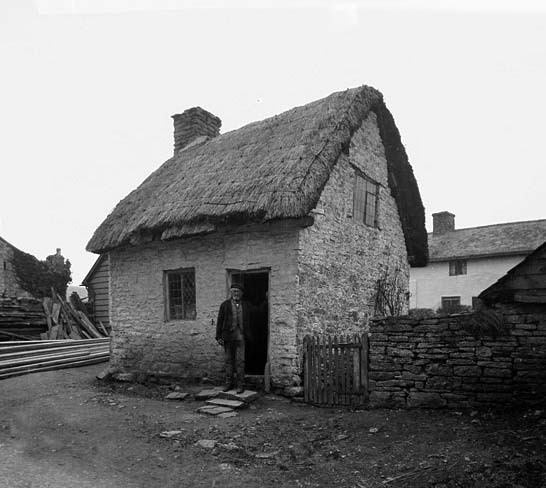 The thatch shown here, is typical for this area, being fairly angular long straw work, with rolled gables. 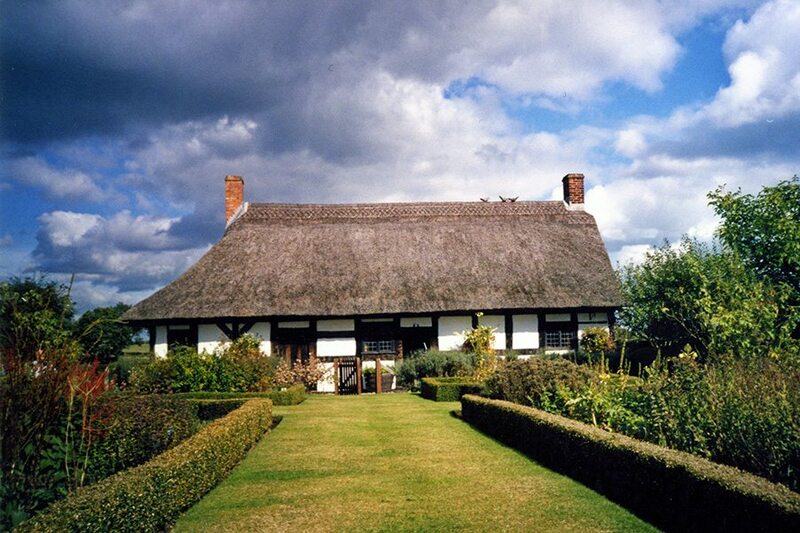 But both roofs also have a rope top ridge. Being very common, over in Wales at this time. 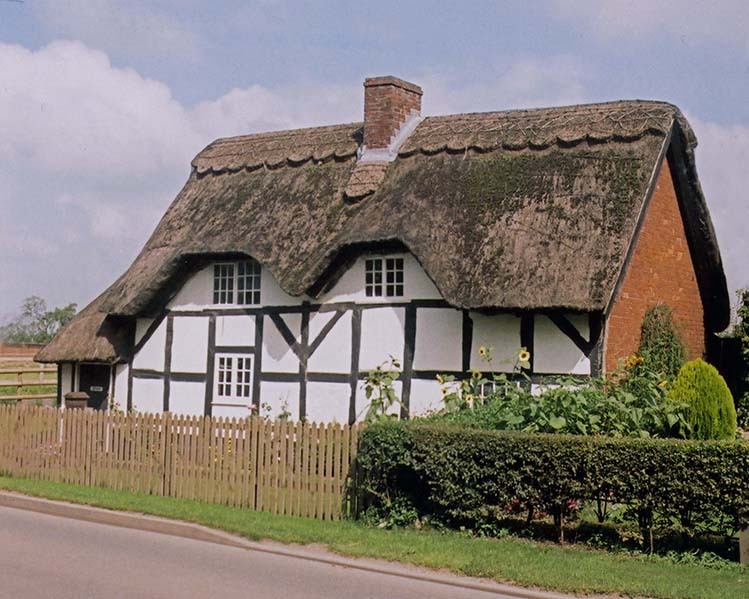 And it seems in the English Marches… A modern thatch is on the right. 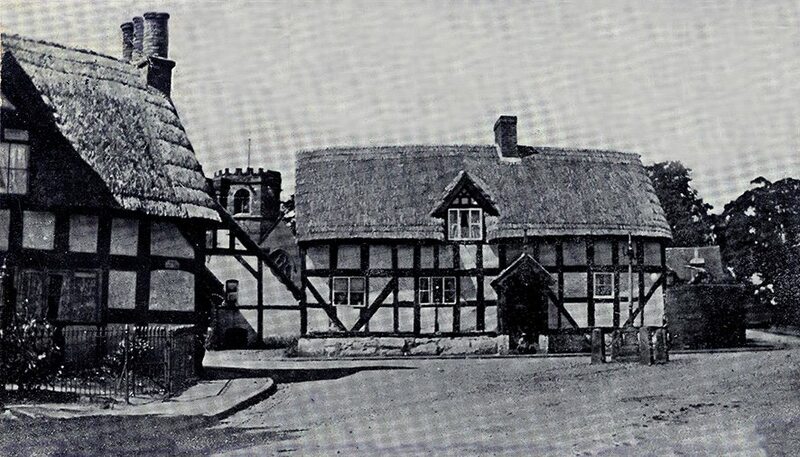 ‘A little bit of old Clun, in the good old days’.. thus ran the title of this early 1900’s postcard, depicted on the left. 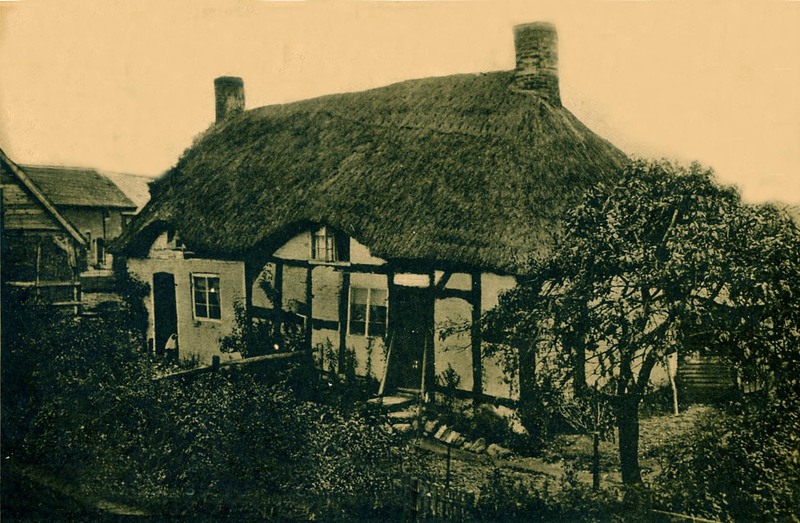 Almost another ‘Little Gem’ as seen at the top of this page… Except the thatch here consisted of repairwork, as used on the local thatched hayricks and corn stacks. 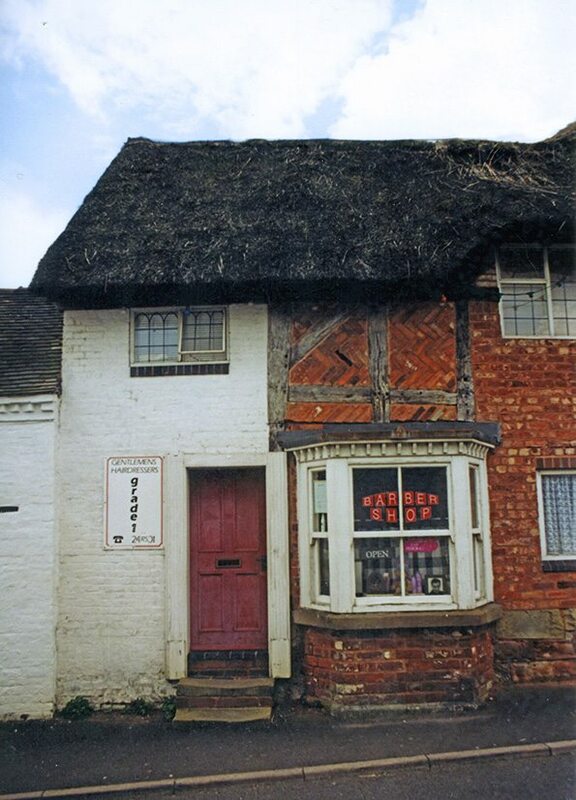 The roof, in this South Shropshire village is long gone, unlike the thatch above, at nearby Clunbury. 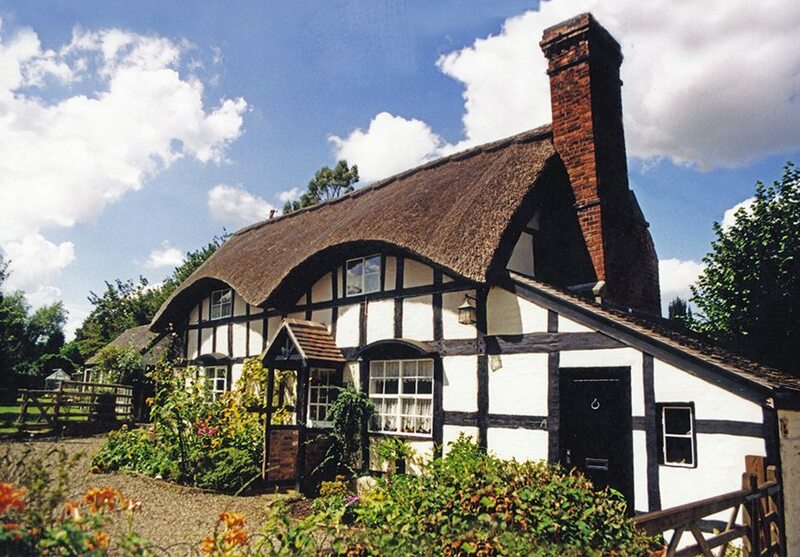 Ashford Bowdler… Where the thatch has some wide eaves, over some locally distinctive, curved windows. 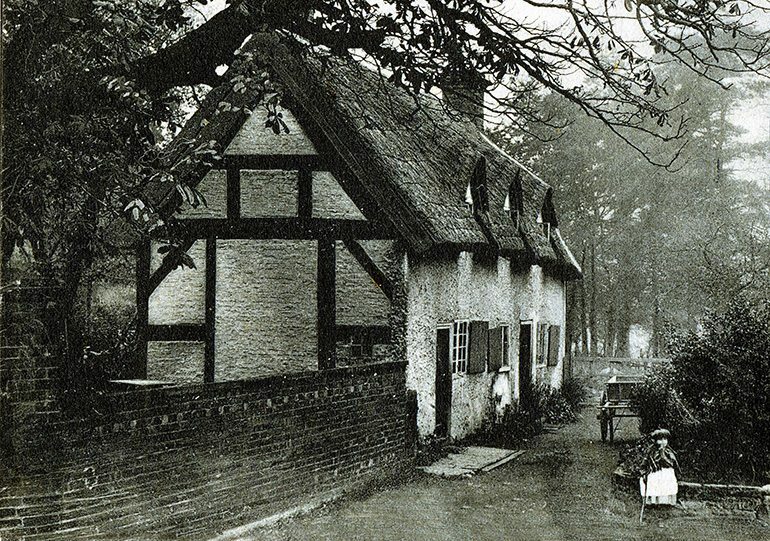 This old postcard states, Here lived ”the old old very old man Thomas Parr’ ‘in the reigns of ten Kings and Queens of England. He was buried in Westminster Abbey, 1635, aged 152 years. 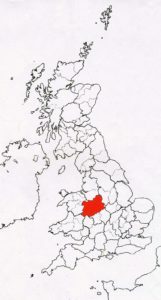 Tom lived at Winnington, very close to the border with Wales. He became a celebrity late in life, after Thomas Howard, Earl of Arundel, brought him from Shropshire to London, to meet King Charles I. The London air proved fatal for Tom and he died in November 1635, blind and with only one tooth. He was dissected, in the presence of the court and in honour of the Queen’s birthday…. At least he had a decent burial in Westminster Abbey. His advice for others, wishing to live long was.. ” keep your head cool by temperance and your feet warm by exercise. Rise early, go soon to bed, and if you want to grow fat (i.e. Wealthy) keep your eyes open and your mouth shut”.